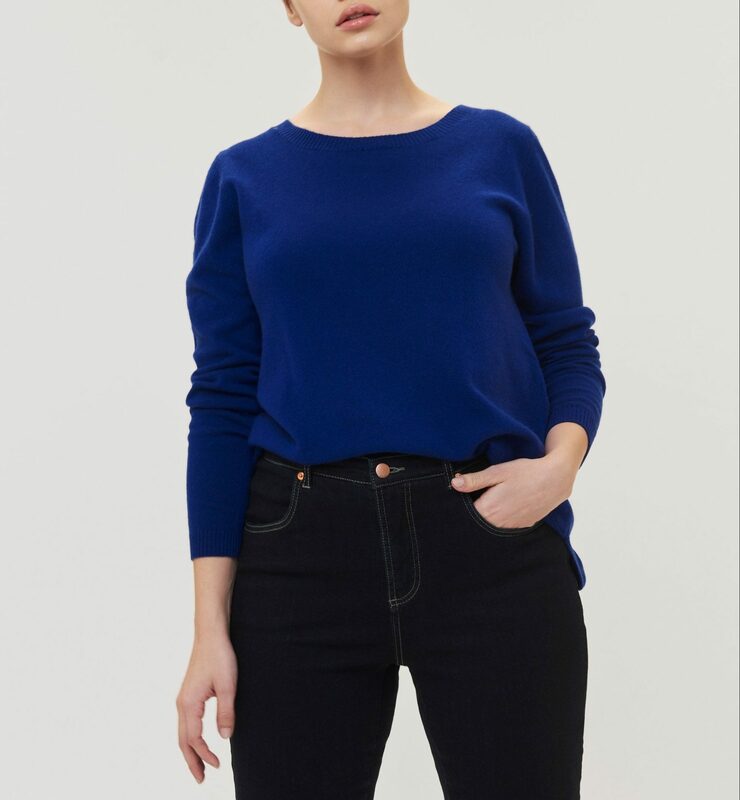 There is some spendy stuff in this post, but there’s a lot of cheap cashmere too, because I’ve gone cheap and I’ve gone expensive and they all get crapped up and pill at the same rate (if you know of a brand that this isn’t true of, please do by all means share in the comments). I think this is maybe the most polished hoodie I’ve ever seen. 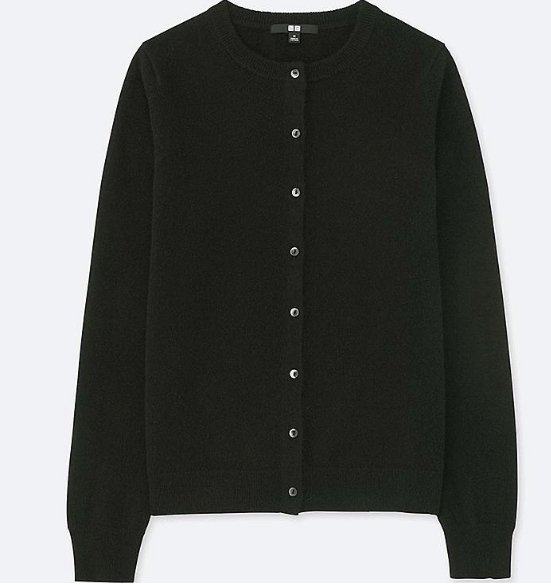 White+Warren makes good cashmere that isn’t cheap but also doesn’t cost a fortune, and this boyfriend cardigan is nice and streamlined and not sloppy-looking, as boyfriend cardigans can sometimes be. I like that this doesn’t look at all like it would be soft, but it is. From Universal standard: a really good blue crewneck. 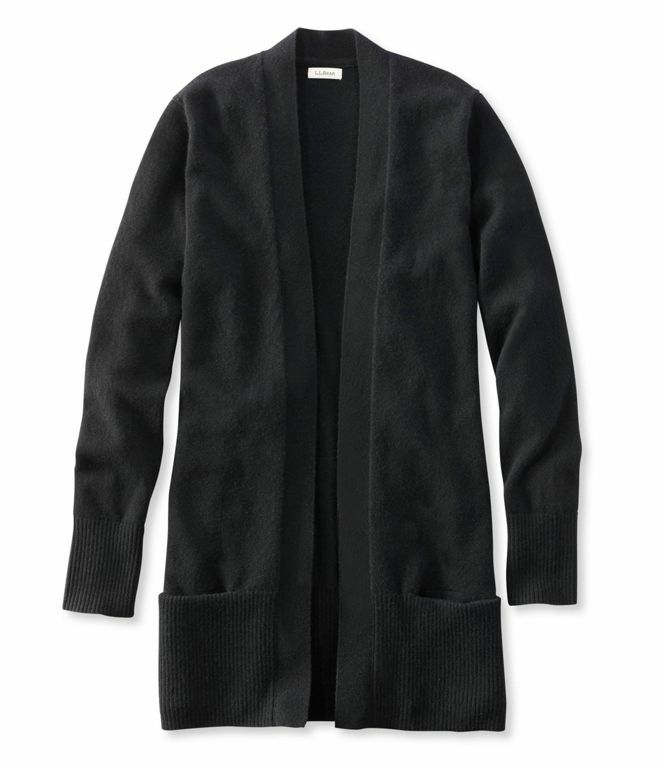 Everyone needs a basic black cardigan, and you can’t beat the price of Uniqlo’s. 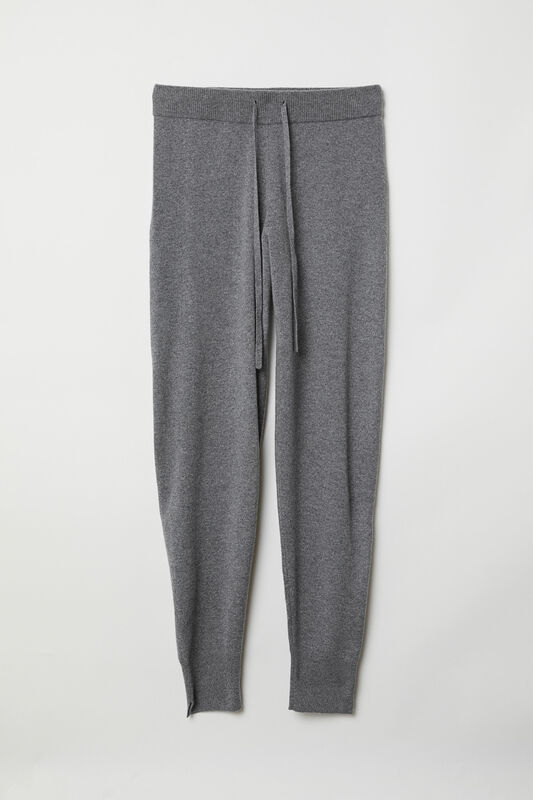 Cashmere sweats were made for early morning dog walking, and lounging of all sorts. 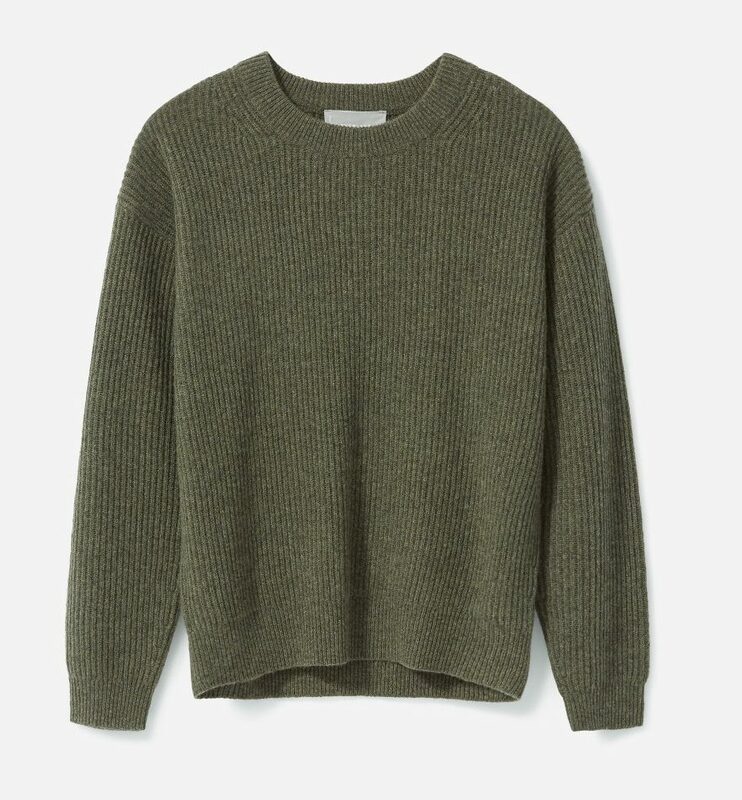 Everlane just introduced this ribbed sweater, which comes in a few colors, but I’m liking the army green. Meanwhile, this Boden sweater is offered in a multitude of colors, but I really dig it in rainbow stripes. An attractive and versatile funnelneck from Vince. 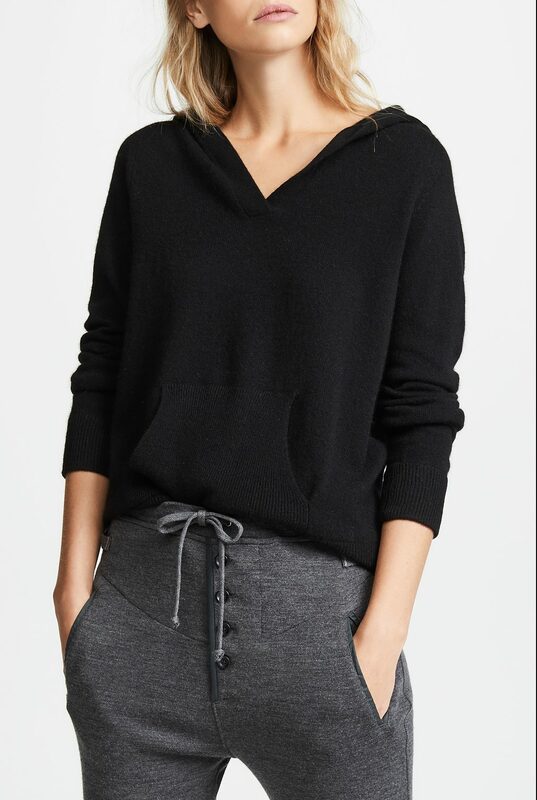 A good, slouchy v neck at an amazing price. The color combination on this travel wrap is just gorgeous. And finally: a good, clean-lined open cardigan. I looove cashmere too. I have 6 sweaters and 2 pairs of pants so I know a little of which I speak. -Rosie for Autograph, shipped from the UK, does not pill, not after years and years of wearing. I’ve had her sweats for 5 years and they still look great. -Edinburgh Woolen Mills, also from the UK is the standard but a bit conservative. 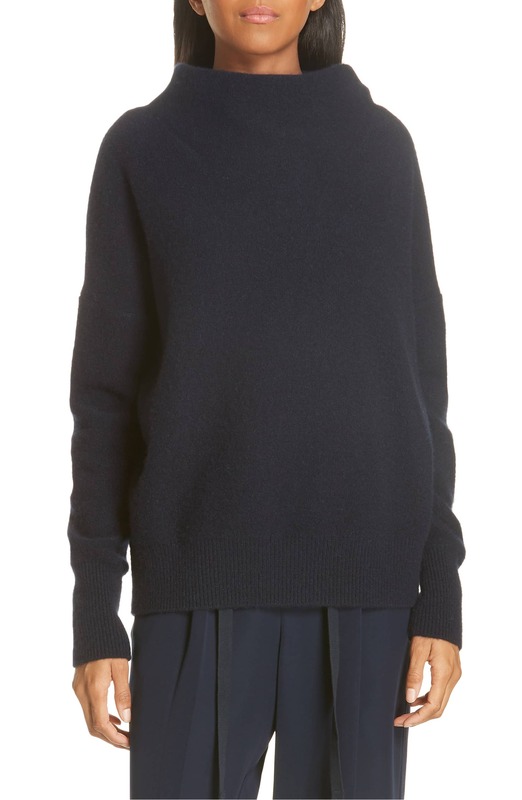 -I bought some cashmere pants from Everlane and within the week they pilled. -Pure Cashmere is wonderful and so stylish but pricey and with 3 grades of cashmere, I’m in heaven. I have a fabulous de-pill device from Walmart; works like a charm. Conair Battery Operated Fabric Defuzzer. Works on all kinds of wool coats too. I looove cashmere too. I have 6 sweaters and 2 pairs of pants so I know a little of which I speak. -Rosie for Autograph, shipped from the UK, does not pill, not after years and years of wearing. I've had her sweats for 5 years and they still look great. -Edinburgh Woolen Mills, also from the UK is the standard but a bit conservative. -I bought some cashmere pants from Everlane and within the week they pilled. -Pure Cashmere is wonderful and so stylish but pricey and with 3 grades of cashmere, I'm in heaven. I have a fabulous de-pill device from Walmart; works like a charm. Conair Battery Operated Fabric Defuzzer. Works on all kinds of wool coats too. Also have the Conair defuzzer and it is great. I regularly use it on a Madewell wool long cardigan and other sweaters. I just wish it could somehow magically make the pilling stop altogether. Sweats. Bought a pair of merino wool ones a couple of years ago at Orvis. They are not itchy at all; have enough heft that I’ve actually worn them to work (with booties and a jacket); and wash in the machine like a dream. I just put them in a large mesh bag, wash on gentle, pull them out, shape and let air dry. They are one of my very favorite purchases. So warm. Versatile. NO PILLING. Sweats. Bought a pair of merino wool ones a couple of years ago at Orvis. They are not itchy at all; have enough heft that I've actually worn them to work (with booties and a jacket); and wash in the machine like a dream. I just put them in a large mesh bag, wash on gentle, pull them out, shape and let air dry. They are one of my very favorite purchases. So warm. Versatile. NO PILLING. I woke up this morning to cool fall cloudy weather and I swear the first thing I thought as I let Betty out the front door to do her business is, “dang, I need a cashmere hoody!” And “ta da” you provided, Kim! 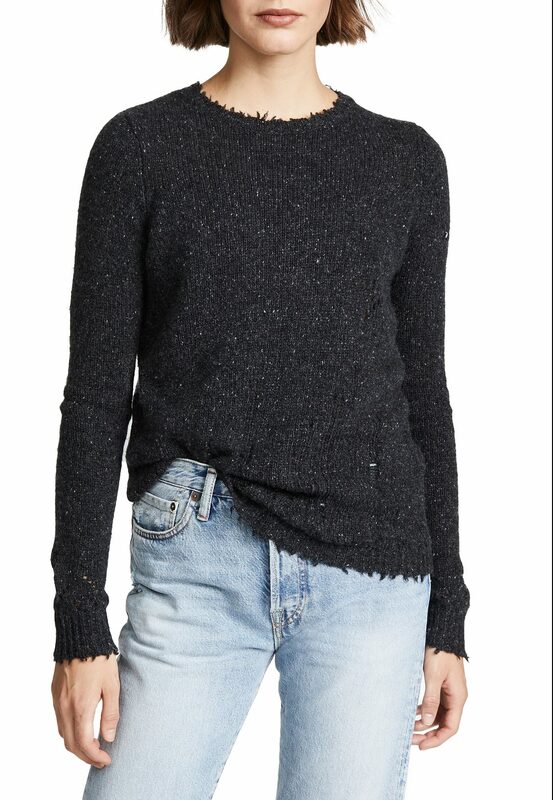 Also love that distressed sweater. Am I the only one or do others find cashmere just a scratchy to the skin as wool? Can’t wear any of it without something underneath––which is a drag, but there you have it. I woke up this morning to cool fall cloudy weather and I swear the first thing I thought as I let Betty out the front door to do her business is, "dang, I need a cashmere hoody!" And "ta da" you provided, Kim! Also love that distressed sweater. Am I the only one or do others find cashmere just a scratchy to the skin as wool? Can't wear any of it without something underneath––which is a drag, but there you have it. You’re not the only one! I can’t wear wool or cashmere (or any animal fiber) next to my skin. I always need a layer and don’t understand why Everlane won’t make a long sleeved version of their cotton v-neck tee. You're not the only one! I can't wear wool or cashmere (or any animal fiber) next to my skin. 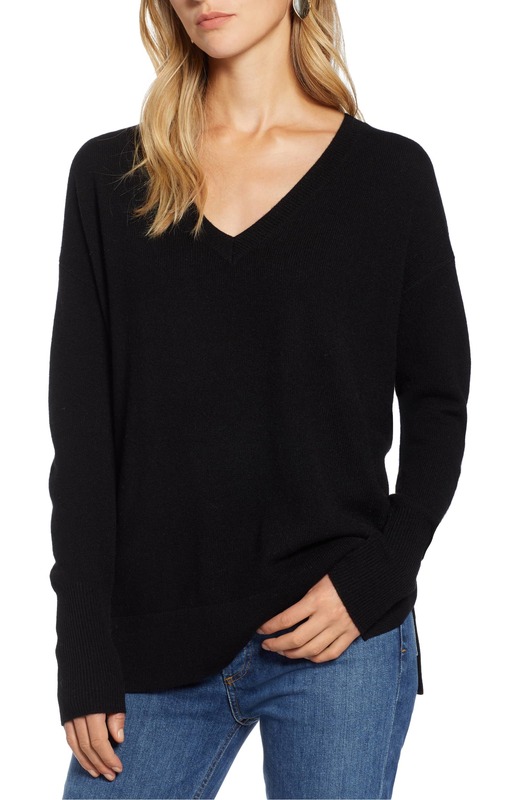 I always need a layer and don't understand why Everlane won't make a long sleeved version of their cotton v-neck tee. I bought a couple of these J. Crew sweaters. The fit is great for me but I washed one and it is pilling a bit. Thanks to your recommendation a while back those cashmere sweatpants have seen me through quite a few international overnight flights. This is the first time that GOCA has featured something that I have–the Boden striped sweater. I would be careful with the Halogen cashmere–it pills like crazy. I used to love the Land’s End cashmere, but now it is shorter and pills terribly. I am trying Uniqlo this year. Fingers crossed…..
GOACA, sorry. Pushed send too fast. But did also want to say that I wear a ton of cashmere and I’ve had expensive and not expensive and now I mostly always go cheaper. I didn’t see the difference in quality. GOACA, sorry. Pushed send too fast. But did also want to say that I wear a ton of cashmere and I've had expensive and not expensive and now I mostly always go cheaper. I didn't see the difference in quality. My best cashmere pieces are by Garnet Hill and Eileen Fisher. Don’t make that face. They’ve got some good shapes and tend to be well-cut and drapey. White + Warren makes fantastic cashmere travel wraps. “don’t make that face”! I love that. The only face I’m making at you is a big smiley face, maybe with hearts for eyes. "don't make that face"! I love that. The only face I'm making at you is a big smiley face, maybe with hearts for eyes. The least silly cashmere I’ve ever worn is Brora. Oh, and TSE, back when. The least silly cashmere I've ever worn is Brora. Oh, and TSE, back when. I’ve had luck when the cashmere is blended. Especially with cotton, for some reason it pills so much less. I've had luck when the cashmere is blended. Especially with cotton, for some reason it pills so much less. Eric Bompard cashmere from France is the hands down best. They ship internationally, and their prices during the twice yearly sales are pretty darn good. They are also fair trade. I have WAY too many sweaters in my cupboard and a few scarfs and some sweats from them (I lived in Paris for 3 years) and all have held up extraordinarily well, pilling is my nemesis and I think theirs is the best. Eric Bompard cashmere from France is the hands down best. They ship internationally, and their prices during the twice yearly sales are pretty darn good. They are also fair trade. 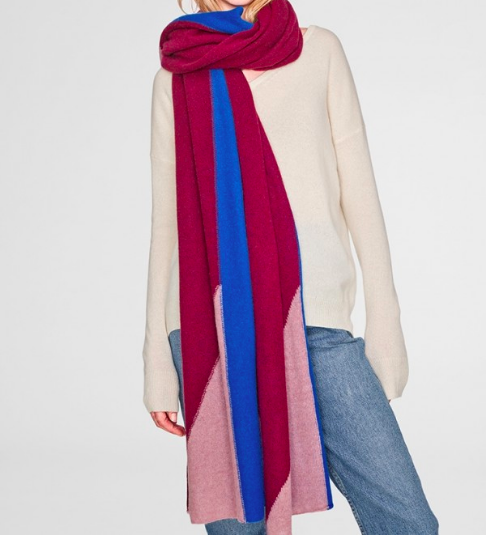 I have WAY too many sweaters in my cupboard and a few scarfs and some sweats from them (I lived in Paris for 3 years) and all have held up extraordinarily well, pilling is my nemesis and I think theirs is the best.